Beyond Airline Disruptions: The La-la Life of Flight Delays - Isn’t It High Time to Rethink Flight Delays and Reinvent Their Role in Aviation Management? The La-la Life of Flight Delays - Isn’t It High Time to Rethink Flight Delays and Reinvent Their Role in Aviation Management? In La-La land it has become common and ordinary to deny truth about delays and instead engage in creation of confusing reports so that by-products of hub concentration and inefficiencies remain unknown – right up to the moment when accumulated problems erupt, triggered by predictable but unforeseen events and reveal the vastness of system weaknesses. Here are some insights and facts on fallacies in delay reporting. To understand delays as indicators of forthcoming problems, we need to step above operational environment, so that we can see what drives changes in planned operations, cost, and revenue loss, their true origins, and their impact on passengers. Further, we must be aware about interconnections between people, data, involved in these processes. We also need to keep monitoring the effectiveness of investment in schedule buffers, additional aircraft, crew, and maintenance resources needed to keep punctuality at acceptable level. In this way, we merge the elements of cost and service quality into a single system – something that segmented information systems and legacy practices cannot provide. Of all these integral elements of delays, current metrics is narrowed down to delayed departures and arrivals. Even this data is not consistent and reliable due to the stretchy references and possibilities for subjective inputs. 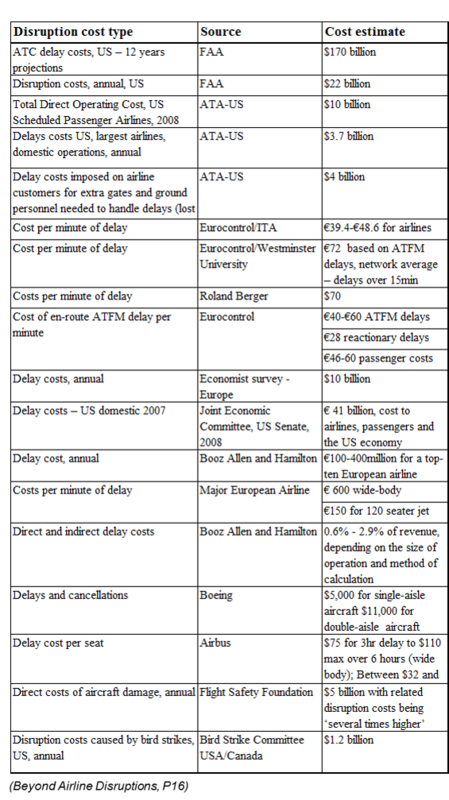 (Find out more about delay references in the excerpt from Beyond Airline Disruptions). There are no rules and no responsibility for quality and accuracy of delay reports. 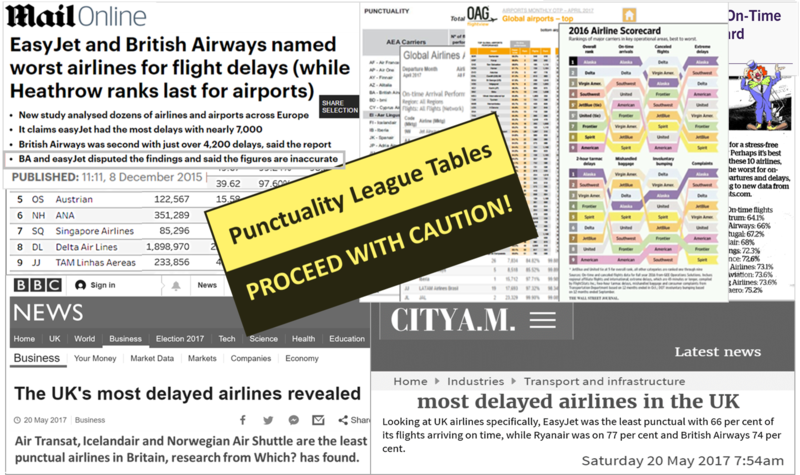 Instead of taking a leading role in improving industry standards, regulators and industry organisations have become the observers and critics of the chaotic state in punctuality reporting, as shown below. This note accompanied the AEA Consumer Report before it was suspended in late 2000s. ‘Whilst punctuality of commercial aircraft operations is one of the key measures of airline and airport performance, consumer access to punctuality data aggregated across the EU for both airlines and airports is very limited’… ‘Data reporting on a pan-European basis is primarily limited to airline de-identified monthly reports produced by EUROCONTROL's Central Office for Delay Analysis (CODA)’ which keeps the data ‘under strict confidentiality and no attempt is made or permitted to identify the performance of any individual airline’ (EU officials). European Commission does not guarantee the accuracy of the information given in their commissioned report ‘Annual Analyses of the EU Air Transport Market 2011’, carried out for the Directorate General for Mobility and Transport in the European Commission (includes punctuality&delays), nor does it accept responsibility for any use made thereof'. What are the reasons for such strong denial of responsibility coming from industry officials? How much does the absence of standards for delay reporting, especially the use of schedule references distort the truth about delays? The following examples can give you some ideas. Here is how this major event was recorded in CAA’s monthly report. This kind of insights is only possible during events of bigger scale that expose otherwise hidden causes and consequences of disruptions to public scrutiny. At the moment, Heathrow is the world’s busiest two-runway airport operating at 98% capacity at all times, so any disruption has an immediate impact on some of 1300 flights per day. Instead of expected decline in punctuality, Heathrow reports the improvement over the last decade, indicating that punctuality can grow with congestion, but can it really? The punctuality of British Airways doesn’t quite follow the Heathrowish direction. Nor does it match the CAA statistics. 54% of 224,497 incoming flights were held in holding stacks in 2010. By comparison, 14% of Gatwick incoming flights were held in stacks and 5% at Stansted. 18 million arriving passengers were kept circling in holding patterns for up to 20 minutes on a normal day and 45 minutes in bad weather. Airlines wasted around £65 million in fuel while stack in the holding queues. Airborne holding at Heathrow amounted to the equivalent of having approximately 10 aircraft grounded at airport each day. By comparison, in 2004 the equivalent of 5 British Airways aircraft a day were circling in airborne stacks above Heathrow. Can you explain the following difference in on-time departures reported by flightstats.com and flightontime.info? Who really tops the OAG rank table for medium airports in 2016? Unlike the CAA who denies responsibility for data accuracy, OAG, the reseller of airline and airport information, doesn’t do so. Considering the messy state of delay references, one can question the OAG claim that they ‘provide accurate, timely and actionable information and applications across the travel sector to the world’s airlines, airports, government agencies, aircraft manufacturers, consultancies and travel related companies’. Who really tops punctuality league tables, why, and for how long considering their short shelf life? Should the big data recyclists be kept accountable for the misleading delay information and for putting the company’s reputation at risk? 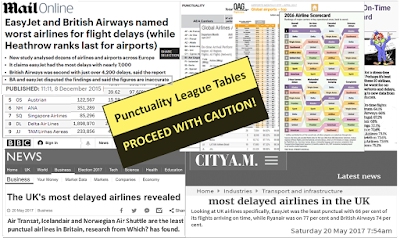 In the absence of regulation and standards, airline and airport punctuality rankings have inevitably become influenced by subjective assumptions and interpretations of the data compilers and resellers, driven mostly by their commercial interests. 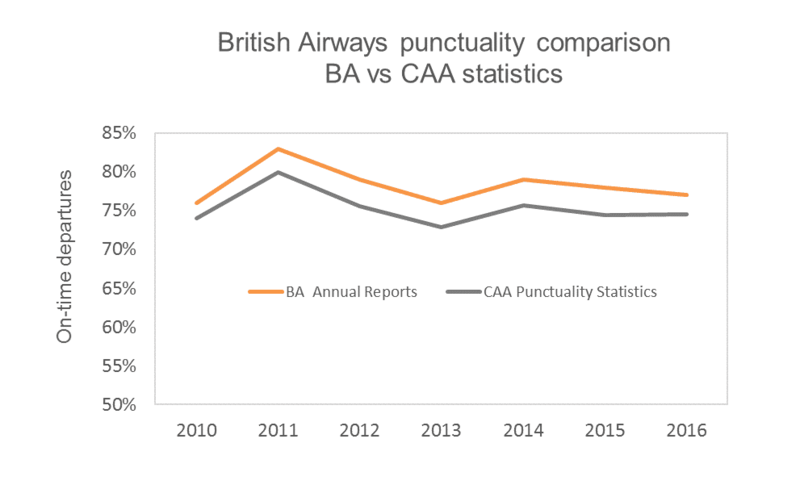 By ignoring diversity and lacking the transparency of benchmark criteria and information they have made a mockery of quality – an invaluable measure of airline and airport performance. Data compilers like Skytrax, AirHelp, OAG, GEE Operations Soltions, flightontime.info, and flightstats.com support and feed off each other's data. They have found partners in the mainstream and social media who market their flawed products and spread the misinformation further. No wonder that some airlines are now looking for legal help. This situation will only get worse if the creation of an industry framework for delay reporting and Consumer Reports keeps being postponed. The following table describes the state of delay cost (dis)information based on local, frozen-in-time, non-actionable assumptions. Despite the evident inaccuracies, obsolescence, and inconsistency, delay reports are being used widely across the industry. They are used to support even the high level decisions like, for example, the expansion of airport capacity in the UK (see Final Delay Impacts Assessment undertaken by the UK Airports Commission). Delays hold important messages. They can help with determining the trend and direction of the industry’s many facets. Failing to accurately monitor and interpret these messages is like failing to measure drift and determine wind speed and direction while in flight. It is important to alter the way we think about delays. Put accuracy aside, assume that it has to be right and then consider this. Let's say you expected punctuality to be 78% but it was down to 72%. What do these figures mean anyway? What do you know about the situation that created the delays? What was their impact on costs? What were their true root causes? How many passengers were affected? How efficient are schedule buffers? How efficient and productive are the aircraft? If you want to improve punctuality effectively, you need to know this information. When you look at 78%, the information is not there. When you are told punctuality is 72% instead of 78% all you know is that you missed your target. By including the DDS (Deep Delay Scan) technique that combines numerical and non-numerical information, you will be able to answer these questions, predict what comes next and what you can do to minimise the risk of losses in cost, revenue, and reputation. All you need to do is to combine the very best of what we have and find a better way of using it, assuming the introduction of new standards, methods, and techniques that allow an integrated view on system dysfunctions and prevent them from spreading wide and into the future. It requires involvement of industry leaders and smart regulation that inspires improvement, where interests of passengers, individual airlines, airports, and ATC services are respected, well balanced, and is open to changes. This is not a difficult nor a costly task, considering the current waste in time and resources that could be used more effectively. And one more thing that can benefit passengers and airlines: if modest reduction of delays and better care of delayed passengers can increase the number of return passengers for say 10%, it will result in 33% more revenue (the work of geometric progression). ON REFLECTION - WHAT IS YOUR ACTION PLAN? Are you ever going to look at delay reports the same way as you did before? Are you going to let them obscure your vision of reality or make delays your allies that help you understand the true value of your actions from wider perspective? Are you prepared to bridge the gaps between segmented parts of the system, between assumptions and reality, understand their interconnections and measure progress? If you are ready to take this step, Astute Aviation can help you get there with method and technique designed to let you see changes in planned operations from systemwide perspective and support you in making purposeful decisions. Disruptions are like music out of tune. People can listen to it, but not for long.